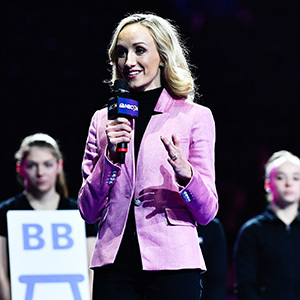 Nastia Liukin was a newly minted Olympic champion zipping from one engagement to the next in 2009 when the idea of creating a competition for promising younger gymnasts first took root in her mind. Having her own meet was not something Liukin had imagined when, as a promising young gymnast herself, she created vision boards outlining her hopes for the future. But when the long-held dream of winning the Olympic all-around title came true in 2008, Liukin found that the gold medal came with a platform to realize her own projects. The more she considered it, the more a competition in her name, something she could put her personal stamp on, ticked the boxes of things she wanted to accomplish post-Beijing. High on that list: Giving up-and-coming gymnasts a chance to showcase their skills on a big stage. It wouldn’t be a normal, run-of-the-mill meet, she would make sure of that. The field would be made up of Level 10 gymnasts, who compete one step below the elite level, and culled from a series of qualifying meets held around the country. It would be on a podium and broadcast live on television. It would have the look and feel of a high-profile competition, because that’s just what it would be. Between the engagements and appearances that pepper an Olympic gold-medalist’s schedule, Liukin sat down with a team from USA Gymnastics and made her pitch. 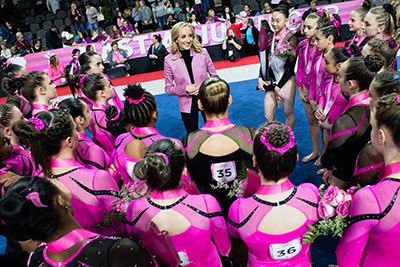 Though not intended to be a competition that pinpoints Olympic-level talent, the Nastia Liukin Cup has nonetheless served as a launchpad for storied elite careers. Among the 36-woman field at the inaugural edition in 2010 was a young gymnast from Virginia named Gabrielle Douglas, whose daring and athleticism marked her as one to watch. In London 30 months later, Douglas succeeded Liukin as the reigning Olympic all-around champion. Past Nastia Liukin Cup champions include NCAA standouts Mackenzie Brannan (University of Alabama), Rachael Flam (Stanford University), Charity Jones (University of Oklahoma), Alex McMurtry (University of Florida), Lexie Priessman (Louisiana State University) and Grace Williams (University of Nebraska). Five other participants — Douglas, Morgan Hurd, Ashton Locklear, Maggie Nichols and MyKayla Skinner — have gone on to win gold at the World Championships, while 2009 World vault champion Kayla Williams qualified to the meet in 2011 after stepping away from the elite level as she prepared to embark on an NCAA career at Alabama. These days, the Nastia Liukin Cup is the first event of USA Gymnastics’ Triple Cup weekend that includes Saturday’s American Cup and Elite Team Cup, featuring junior elite male gymnasts from each region of the country. For the 36 who qualify, the Nastia Liukin Cup is sprinkled with special touches, including a gymnasts-only brunch hosted by Liukin on the morning of the competition. Liukin has a hand in all aspects of the competition, from designing the numbers on the back of the leotards to the leotards themselves, a project she embarks on each year with her mom, Anna. For the 10th edition of the competition, the custom design is on the bedazzled side.